Rakesh Jhunjhunwala, Porinju Veliyath, and Dolly Khanna are top notch stock market investor. They have created massive wealth from the stock market. They are master in picking up multibagger stocks. Blindly following stock picks by big investors is not a wise thing to do. However, if you have blindly followed Rakesh Jhunjhunwala, Porinju Veliayth, and Dolly Khanna in the year 2017, you would have become crorepati by now. 10 stocks from the portfolio of Jhunjhunwala, Porinju and Dolly Khanna has given magnificent returns in the year 2017. All these stocks were from small-cap and mid-cap space. The detail of 10 Multibagger stocks from Jhunjhunwala, Porinju and Dolly Khanna Portfolio is given below. From the portfolio of Rakesh Jhunjhunwala, nearly five stocks more than doubled investors wealth. These included Geojit Financial Services, Prakash Industries, Edelweiss Financial Services, Escorts and VIP Industries. Among these stocks Prakash Industries stock is at number one position with 2017 YTD return of 339%. Chennai based couple Dolly Khanna and Rajiv Khanna have got three multibagger stocks in their portfolio. These include names like Rain Industries, Emkay Global Financial Services, and NOCIL. Among these stocks, Rain Industries soared 605% and Emkay Global Financial Services soared 296%. 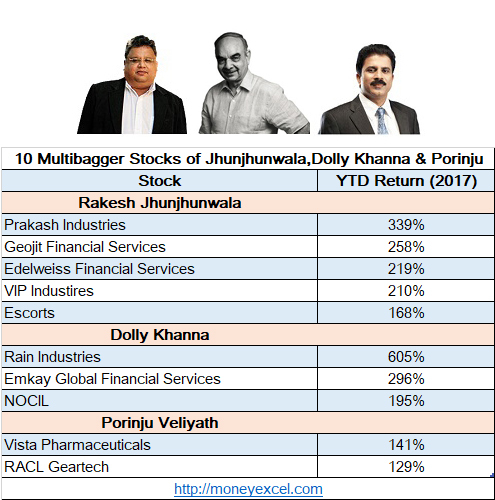 A Kochi based investor Porinju Veliyath, who is also known as small cap czar has also got two multibagger stocks in his portfolio in 2017. These stocks are Vista Pharmaceutical and RACL Geartech. Both these stocks have generated more than 100% return for the investors. Rakesh Jhunjhunwala believes in “Buy right sit tight” philosophy. You should find out quality stock for the investment and stay invested for long term. Jhunjhunwala had invested in Geojit Finance in 2004. He has added more stocks in his portfolio gradually. One should make an investment in the stock when the stock is not so popular. When the stock is not popular the stock price is low this means a chance of getting profit is more. Jhunjhunwala made an investment in the stocks when they are not so popular. Another mantra of Jhunjhunwala is if you see an opportunity you should grab it before it is too late. However, make sure fundamental of stock is good when you make an investment. Don’t invest in a stock based on opinion or speculation. Invest in stock based on facts and figures like balance sheet, quarterly result, and information available in the public domain. Study market situation and pick stock accordingly. Invest only in small cap & mid-cap stocks. The chance of getting multibagger returns in this segment is very high. Dolly Khanna portfolio clearly says that invest only in small-cap or mid-cap stocks. Porinju Veliyath believes in buying high-quality lesser-known stocks. Entire portfolio holding of porinju is full of less –known, high-quality business. This style is also adopted by Rakesh Jhunjhunwala. I hope learning given above from the stalwarts of the stock market will help you in making an investment in the stock market. Do share your views in the comment section!